We unfortunately came across a post on the Haomarush forum from somebody posting on a lvl zero char to do some very direct bitching about the guild. Unfortunately, the actual post got removed and now the thread is locked but it is available to see in all its glory in a quote. 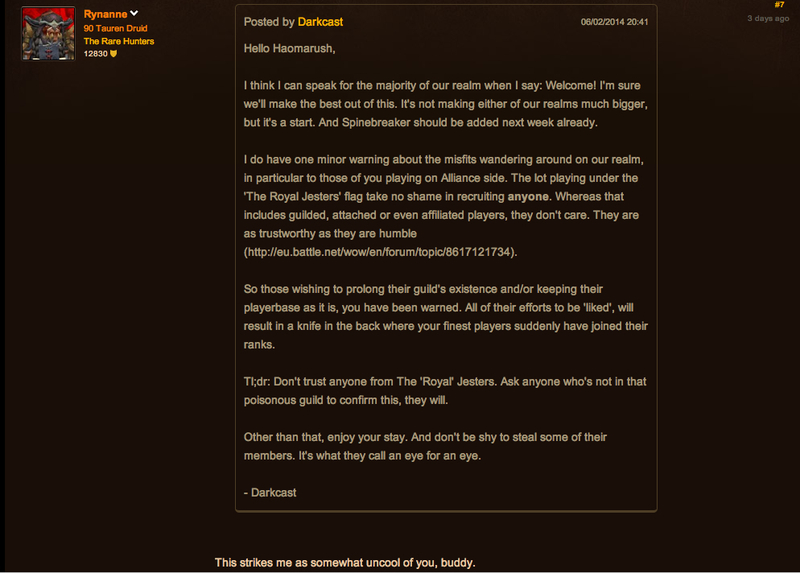 Not only was this person not even posting in our own realm forum, they clearly thought that everyone else needed to be warned about ‘our untrustworthy behaviour’ but they were not confident enough about their own convictions to post while logged in on a main. It’s a case of serious sour grapes on their part. Firstly it’s clearly someone who has felt that we steal the best players from other guilds and then they also get pissed off and QQ when any mention of how well the guild is doing is mentioned. The link that they post is ‘here’. 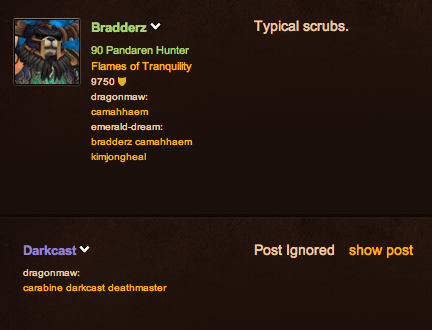 There are a few ways to see who people are on the forums. One way is to use the little no-entry/stop sign to hide posts by the person. Ive used Bradderz as an example for what it looks like. Using Bradderz as an example again, here is what came up. Deathmaster from Anomia. This person has some serious beef with our guild for some reason that they would not like to disclose to us but just spout venom onto the forum of a different realm… and to top it all off, they are the GM… oh dear.